OpenVMS is a closed-source, proprietary computer operating system for use in general-purpose computing. It is the successor to the VMS Operating System (VAX-11/VMS, VAX/VMS), that was produced by Digital Equipment Corporation, and first released in 1977 for its series of VAX-11 minicomputers. The 11/780 was introduced at DEC's Oct. 25, 1977 annual shareholder's meeting. In the 1990s, it was used for the successor series of DEC Alpha systems. 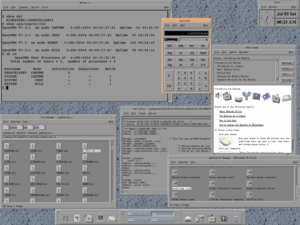 OpenVMS also runs on the HP Itanium-based families of computers. As of 2019[update], a port to the x86-64 architecture is underway. Among OpenVMS's notable features is the Common Language Environment, a strictly defined standard that specifies calling conventions for functions and routines, including use of stacks, registers, etc., independent of programming language. Because of this, it is possible and straightforward to call a routine written in one language (Fortran) from another (COBOL), without needing to know the implementation details of the target language. OpenVMS itself is implemented in a variety of different languages (primarily BLISS, VAX Macro and C), and the common language environment and calling standard supports freely mixing these languages, and Ada, PL/I, Fortran, BASIC, and others. This is in contrast to a system such as Unix, which is implemented nearly entirely in the C language. DEC's OpenVMS Operating System documentation for various releases, and for various core OpenVMS layered products, is available online at the HPE website. In 2011, HP staff took over the administration of the hobbyist licences. Registration was simplified and remained zero cost. The process from registering to receiving Product Authorisation Keys typically takes about one working day. Software kits for operating system and layered products were made available on request via FTP download (previously it had to be shipped on CD which was chargeable). This process is not fully automatic and requires authorisation by HP Hobbyist Program staff. FreeVMS is an attempt to develop an open source operating system following VMS conventions. As of April 2019[update] the associated mailing list had been totally inactive for two years and shown limited activity for some years prior to that. FreeVMS supported the x86-64 architecture using an L4 microkernel. ^ "2.7 In what language is OpenVMS written?". The OpenVMS Frequently Asked Questions (FAQ). Hewlett Packard Enterprise. ^ a b Patrick Thibodeau (June 11, 2013). "OpenVMS, R.I.P. 1977-2020?". Computerworld. ^ Tom Merritt (2012). Chronology of Tech History. p. 104. ISBN 130025307X. ^ "VAX 11/780 - OLD-COMPUTERS.COM : HISTORY / detailed info". ^ "HP OpenVMS Systems". Hewlett Packard Enterprise. ^ "State of the Port to x86-64". VMS Software. August 4, 2018. ^ a b c "OpenVMS Rolling Roadmap" (PDF). VMS Software. June 5, 2018. ^ "HPE Partner Ready Program - Business Partners & Reseller Programs". h21007.www2.hpe.com. ^ OpenGL Frequently Asked Questions (FAQ) [1/3]. Faqs.org. Retrieved on 2013-07-17. ^ "The Uptimes-Project.org - Host Information: WVNETcluster". Archived from the original on 2009-01-24. Retrieved 2009-04-10. ^ a b "HP hands off OpenVMS development to VSI". Tech Times. 2014-08-01. Retrieved 2016-01-29. ^ a b c "VMS Software, Inc. Named Exclusive Developer of Future Versions of OpenVMS Operating System" (Press release). Retrieved October 27, 2017. ^ "VMS Software". www.vmssoftware.com. Retrieved 2016-01-29. ^ "Gordon Bell Biography". research.microsoft.com. ^ Michael D Duffy (2002). Getting Started with OpenVMS: A Guide for New Users. ISBN 0080507352. ^ "OpenVMS Definition from PC Magazine Encyclopedia". ^ a b "OpenVMS Compatibility Between VAX and Alpha". May 1995. ^ OpenVMS At 20. Digital Equipment Corporation. 1997. Chapter X Building the Bridge to Alpha; Chapter XI AlphaChip—The 64-bit Breakthrough. ^ Nancy P. Kronenberg; Thomas R. Benson; Wayne M. Cardoza; Ravindran Jagannathan; Benjamin J. Thomas III (1992). "Porting OpenVMS from VAX to Alpha AXP" (PDF). Digital Technical Journal. 4 (4). ^ a b "VMS Software, Inc. Launches New Release of OpenVMS OS for Alpha Hardware: Worldwide Production Release of VSI OpenVMS Alpha V8.4-2L1 Provides a Bridge to the Future" (Press release). Retrieved 2017-11-02. the Alpha hardware platform, including Alphas running on x86-based emulators. This OpenVMS Alpha version is based on, and inherits the benefits of, the latest version of VSI OpenVMS Integrity V8.4-2L1, released in September 2016. ^ "Compaq OpenVMS Times" (PDF). January 2002. Archived from the original (PDF) on March 2, 2006. ^ Clair Grant (June 2005). "Porting OpenVMS to HP Integrity Servers". OpenVMS Technical Journal. 6. ^ "Access to OpenVMS Source Code?". HP OpenVMS Systems ask the wizard. September 2, 1999. ^ "HP OpenVMS Systems - Announcing OpenVMS v8.3-1H1". Archived from the original on December 29, 2007. ^ "HP OpenVMS Systems - OpenVMS Version 8.4". Archived from the original on September 2, 2010. ^ "VMS Software, Inc. Launches New Version of OpenVMS Operating System Worldwide" (PDF) (Press release). June 1, 2015. ^ "VMS Software: Products: Roadmap". ^ "HP OpenVMS Systems - OpenVMS Release History". June 21, 2010. ^ "HP OpenVMS Systems - Supported Software Versions - January 2014". ^ "VMS Software, Inc. Launches New Version of OpenVMS Operating System Worldwide" (Press release). VMS Software, Inc. March 22, 2016. ^ "HP OpenVMS systems documentation - DECnet for OpenVMS V8.4 documentation". ^ "HP OpenVMS Systems Documentation - TCP/IP Services for OpenVMS Documentation". ^ a b "HP OpenVMS Systems - Clusters". ^ a b "HP OpenVMS Systems - High Availability/Disaster Tolerance". ^ a b c "OpenVMS Record Management Services Reference Manual". June 2002. ^ a b "Chapter 1 ACP-QIO Interface". HP OpenVMS I/O User’s Reference Manual: OpenVMS Version 8.4. ^ "Oracle Rdb Product Center". ^ a b "OpenVMS Calling Standard". January 2005. ^ Stephen Hoffman; Paul Anagnostopoulos. Writing Real Programs in DCL, second edition. ISBN 1-55558-191-9. ^ "OpenVMS User's Manual". June 2002. ^ a b "HP OpenVMS Guide to System Security: OpenVMS Version 8.4". June 2010. ^ "Security Configuration Checklists for IT Products - VMS – OpenVMS VAX/ALPHA Security Readiness Review Security Checklist, Version 2 Release 2". Archived from the original on September 21, 2008. ^ "DefCon 9 - What I did on my summer vacation". ^ "Software Product Description - HP DECwindows Motif for OpenVMS V1.6" (PDF). ^ Margie Sherlock. Using DECwindows Motif for OpenVMS. ISBN 1-55558-114-5. ^ "Migrating VWS/UIS Applications to DECwindows?". HP OpenVMS ask the wizard. November 9, 2004. ^ "Software Product Description - HP OpenVMS Cluster Software" (PDF). ^ Kirby McCoy (1990). VMS File System Internals. Bedford, Mass. : Digital Press. ISBN 1-55558-056-4. ^ "README file for clunk routines". November 6, 1987. ^ "The Wombat Examiner, Vol. 3, No. 1". February 1981. ^ Detailed information on time and timekeeping, and on daylight saving time and timezone differential factor operations, is contained in the OpenVMS FAQ. ^ Stephen Hoffman (June 6, 2000). "C bashing (was Re: VMS File Caching Futures". Newsgroup: comp.os.vms. ^ "OpenVMS Programming Environment Manual". March 1994. 7.1 Common Language Environment. ^ "HP OpenVMS Programming Concepts Manual". January 2005. ^ "QuickSpecs - HP OpenVMS Version 8.4 for Integrity and Alpha servers" (PDF). February 14, 2011. ^ "The OpenVMS Frequently Asked Questions (FAQ)". ^ "OpenVMS Debugger Manual". June 2010. ^ "OpenVMS User's Manual". Chapter 14, Advanced Programming with DCL. ^ "HP OpenVMS Systems - HP OpenVMS Security". ^ "HP OpenVMS Open Source Tools - GnuPG for OpenVMS". ^ "HP OpenVMS Systems - Secure Web Server (based on Apache) - Perl for OpenVMS Installation Guide and Release Notes". November 2005. ^ "Orange Notebooks... three-hole binders with individual spine labels, tables of contents, dividers and indexes." "Hindsight: The Orange Notebooks". The DEC Professional. September 1983. p. 94. ^ There were grey binders too. ^ "You should have opened those orange notebooks more often." "Uncle Al". May 19, 2003. ^ "VMS Manuals available ... The first table is manuals in grey or orange binders." "OpenVMS various versions". ^ "Prior to 5.0, the documentation came in Orange binders" "VMS 5.0 - VMS 5.5". ^ "HoffmanLabs :: Home of the OpenVMS FAQ". www.hoffmanlabs.org. ^ "HP OpenVMS Rolling Roadmaps". October 2006. Archived from the original on December 8, 2006. ^ "HP and VMS Software, Inc. Collaborate to Extend OpenVMS Solutions". Retrieved October 27, 2017. ^ "VSI Updates". January 11, 2017. Retrieved 2017-01-11. ^ Thibodeau, Patrick. "HP gives OpenVMS new life". ComputerWorld. Retrieved 1 August 2014. ^ "Software Product Description (SPD) HP OpenVMS for Integrity Servers Versions 8.2-1 and 8.2, and HP OpenVMS Alpha Version 8.2 SPD 82.35.09" (PDF). Hewlett-Packard Enterprise. November 2014. Retrieved October 27, 2017. ^ "OpenVMS News & Discussion". openvms.org. Archived from the original on 2015-03-21. ^ "MVP Systems - The OpenVMS Hobbyist Program". Archived from the original on January 6, 2009. ^ ""Request a login" page, showing list of publicly accessible systems, including VAX-11/785 running VMS". ^ a b "FreeVMS official web page". Archived from the original on September 8, 2018. ^ "The FreeVMS Archives". Archived from the original on 10 April 2019. ^ "OpenVMS on IA-32 ?". ^ For information on layered products, see the Software Product Description (SPD) for the product. For OpenVMS components, see the OpenVMS documentation set. ^ "HP High Availability/Disaster Tolerance - OpenVMS Galaxy". This page was last edited on 11 April 2019, at 06:36 (UTC).